Global climate change is increasingly considered one of the major threats to tropical coastal fisheries, potentially undermining important revenue and food security provided by coral reef ecosystems. While there has been significant and increasing work on understanding specific effects of climate change on coral reef fishes, few studies have considered large-bodied fisheries target species, limiting understanding of the effects of climate change on tropical fisheries. This review focuses on coral grouper (Plectropomus spp., and mainly Plectropomus leopardus), which are heavily fished throughout the Indian and Pacific oceans, and represent an exemplar group to assess potential effects of climate change on coral reef fisheries. In experimental studies, P. leopardus appear to be extremely sensitive to increasing ocean temperature, exhibiting declines in survivorship, aerobic scope and activity with relatively moderate increases in temperature. As such, ongoing ocean warming may jeopardize the catchability of coral grouper and sustainability of reef-based fisheries, especially at low latitudes. Notably, a significant portion of wild stocks of P. leopardus are already exposed to temperatures (≥30 °C) that have been shown to compromise individual performance and body condition. While there are considerable knowledge gaps in predicting effects of global climate change on coral grouper, such as their capacity to avoid, acclimate or adapt to changes in local environmental conditions, current information suggests that there is cause for concern. As such, we take the formative steps to outline both ecological and socioeconomic adaptations that could reduce vulnerability of coral reef fisheries to climate impacts on stocks of coral grouper, using a linked socio-economic framework. The impetus for this review came from workshops funded by the National Climate Change Adaptation Research Facility (NCCARF), with explicit research on effects of climate change on coral grouper funded by Fisheries Research and Development Corporation (FRDC) and a Queensland Government Smart Futures Fellowship awarded to MP. GP was supported by an ARC Future Fellowship. 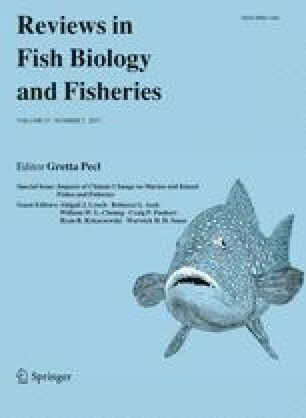 This manuscript benefitted greatly from insights provided by Howard Choat, Tony Ayling, Michele Heupel, and John Kung, and we are indebted to the all researchers involved in the Effects of Line Fishing project (1993–2006), which significantly advanced understanding of coral grouper biology and fisheries.